**** Chosen by Winner: Anthony C.
Brazilian Gustavo Cecchini has crafted one of his Reduced Plasma framelock flipper folders for us this year. It has a 3.5-inch blade of CPM 154 and is 4.7 inches closed. The backspacer is a Steel Flame skull. An agronomic engineer by profession, Gustavo starting making custom knives in 2004. He is primarily self-taught in the art and technique, but his inate skills and vision are clearly evident in his world class knives. Gus took the next logical step and began making folders. With the same learning-by-doing philosophy, Gus engineered his own custom pivot-bearings which he patented and shared with the community. Gus applies this innovative practice constantly and has added many “firsts” to his folders. 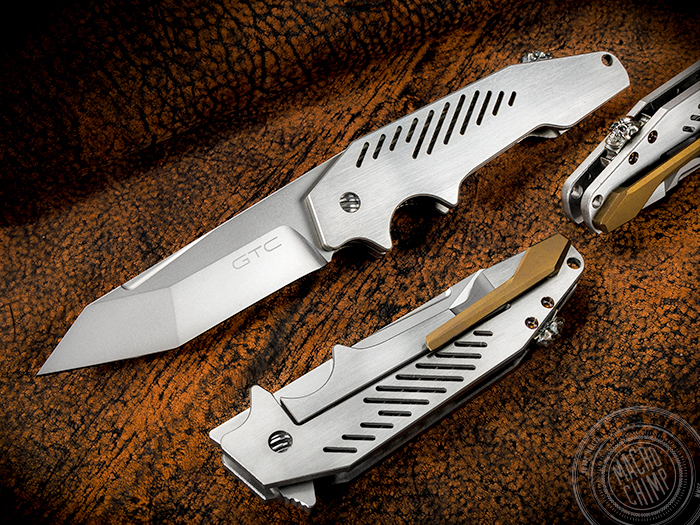 Unique assisted-opening (2008), “Front Framelock” with straight-cut lock-bar (2009), a lock-bar limiter screw, a hidden-clip design that won him “Best Innovative Design” at the 2012 USN Gathering. In 2014 Gus added a “Flush Clip” design to his bag of tricks. This spirit of technical innovation is only part of the GTC formula. A look at the designs from the aesthetics reveals another level of Gus’s creativity. It’s no surprise that his work has graced the cover of Blade Magazine with the caption of “Dress Tactical Folder”.